FILE - A woman cries as she covers her face near her destroyed home a wildfire swept through Ventura, California, Dec. 5, 2017. Ray and Curry Sawyer's Christmas tree is up, still waiting for their grandkids to decorate it. The presents are hidden away in closets, waiting to be wrapped, the ingredients for gingerbread men are sitting in cupboards, and the kindling for the fireplace has been chopped. A monster of a wildfire burning in Southern California froze the Sawyers' plans for a big family Christmas and has forced the couple from their Santa Barbara home for nearly two weeks. Even if their beloved home of five decades survives the next predicted onslaught of winds, the Sawyers are preparing for Christmas in yet another hotel. "This is getting ridiculous," said the 82-year-old Curry Sawyer from her hotel in Goleta on Tuesday. "My husband has the feeling, 'Why aren't they letting us back in?' but they've got hot spots up there and if we get more Santa Ana winds, we're going to be back to square one," Sawyer said. "I'm not sure we're out of the woods." FILE - Flames rise behind a home in Santa Barbara, Calif., Dec. 14, 2017. The Sawyers are among dozens of frustrated evacuees who've been away from home for days and weeks, living out of hotels or evacuation shelters, or staying with friends or family. Some have no home to go back to while others are hoping theirs survive. The Sawyers were planning a big family Christmas with their sons, who each are married and have a daughter, and live in Los Angeles and Amherst, Massachusetts. 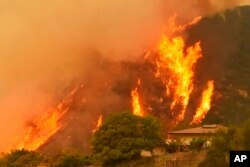 If their home doesn't make it, or if a mandatory evacuation remains in place come Christmas, Sawyer said the family will make do in Los Angeles. Her son's home can accommodate her other son's family, but Sawyer and her husband would have to stay in a hotel. "We'll be more just trying to cramp ourselves into a small space," she said. "But at least we'll be together." As of Wednesday, 432 people were still staying at evacuation shelters run by the Red Cross, agency spokeswoman Georgia Duncan said. The shelters are preparing to stay open for Christmas and many agencies are donating toys so that the children there have presents to open. One company already donated more than 100 bicycles, mostly for children. And Christmas came early for one 5-year-old boy who was handed a Mickey Mouse doll. "He just grabbed it and cried because he had lost all of his toys and just thought there would be no Christmas," Duncan said. "To him, yesterday was Christmas." 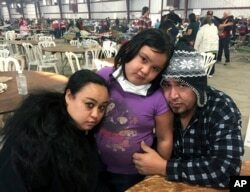 FILE - Wildfire survivors Marolyn Romero-Sim, left, with Hugo Romero-Rodriguez, center, and their 9-year-old daughter, Milagros, sit inside the evacuation center at the Ventura County Fairgrounds in Ventura, Calif., Dec. 6, 2017. Marolyn Romero-Sim, her husband and their 9-year-old daughter have been at an evacuation shelter in Ventura for two weeks after they watched their home of four years, an RV, burn in the wildfire, along with their beloved dog, their Christmas tree and a few presents. The family is trying to save money for another RV, but knows Christmas will probably be spent in the shelter. "I try not to let my daughter know, but I feel horrible," the 34-year-old Romero-Sim said through tears Tuesday. "She's being so understanding. She's just thankful we're going to be together for Christmas." The devastating fire that began Dec. 4 is responsible for two deaths, has destroyed at least 750 homes, and has burned about 423 square miles (1,095 square kilometers), making it the third biggest in the state since accurate records were kept starting in 1932. Officials estimate that the Thomas Fire will grow to become the biggest in California history before full containment, expected by Jan. 7. 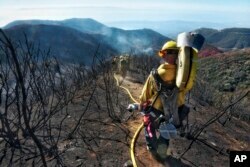 In this photo provided by the Santa Barbara County Fire Department, Santa Barbara County Firefighters haul dozens of pounds of hose and equipment down steep terrain below E. Camino Cielo to root out and extinguish smoldering hot spots in Santa Barbara, Calif., Dec. 19, 2017. "We're going to take a lot of that fuel out of there," fire Capt. Rick Crawford said. "That way when the winds come back, there'll be nothing left to burn." Although some evacuations were lifted Monday and more residents were being allowed to return Tuesday, hillside homes are still threatened in Santa Barbara, where firefighters mounted an aggressive air attack on stubborn flames.